Tamimi, who has been held in custody for over two months, pleaded not guilty to the charges against him and held a defiant speech explaining his motivation for organizing civil resistance to the Occupation. See his full statement below. After more than two months in custody, the trial of Bassem Tamimi, a 44 year-old protest organizer from the West Bank village of Nabi Saleh, finally commenced yesterday. Tamimi, who is the coordinator for the Nabi Saleh popular committee, pleaded not guilty to the charges laid against him. In a defiant speech handed before a crowded courtroom, Tamimi proudly owned up to organizing the protest in the village saying, “I organized these peaceful demonstrations to defend our land and our people.” Tamimi also challenged the legitimacy of the very system which trys him, saying that “Despite claiming to be the only democracy in the Middle East you are trying me under military laws […] that are enacted by authorities which I haven’t elected and do not represent me.” (See Tamimi’s full statement at court bellow). Tamimi was interrupted by the judge who warned him that it was not a political trial, and that such statements were out of place in a courtroom. Tamimi was cut short and not allowed to deliver his full statement. After Tamimi finished reading his shortened statement, the judge announced that the hearing’s protocol has been erroneously deleted. However he refused to submit the full written statement to the stenographer. She went on to dictate a short summary in her own words for official record. The indictment against Tamimi is based on questionable and coerced confessions of youth from the village. He is charged with’ incitement’, ‘organizing and participating in unauthorized processions’,’ solicitation to stone-throwing’, ‘failure to attend legal summons’, and a scandalous charge of ‘disruption of legal proceedings’, for allegedly giving youth advice on how to act during police interrogation in the event that they are arrested. The transcript of Tamimi’s police interrogation further demonstrates the police and Military Prosecution’s political motivation and disregard for the suspect’s rights. During his questioning, Tamimi was accused by his interrogator of “consulting lawyers and foreigners to prepare for his interrogation”, an act that is in no way in breach of the law. I hold this speech out of belief in peace, justice, freedom, the right to live in dignity, and out of respect for free thought in the absence of Just Laws. Every time I am called to appear before your courts, I become nervous and afraid. Eighteen years ago, my sister was killed by in a courtroom such as this, by a staff member. In my lifetime, I have been nine times imprisoned for an overall of almost 3 years, though I was never charged or convicted. During my imprisonment, I was paralyzed as a result of torture by your investigators. 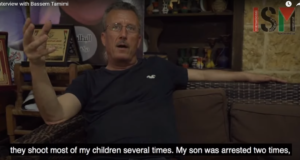 My wife was detained, my children were wounded, my land was stolen by settlers, and now my house is slated for demolition. I was born at the same time as the Occupation and have been living under its inherent inhumanity, inequality, racism and lack of freedom ever since. Yet, despite all this, my belief in human values and the need for peace in this land have never been shaken. Suffering and oppression did not fill my heart with hatred for anyone, nor did they kindle feelings of revenge. To the contrary, they reinforced my belief in peace and national standing as an adequate response to the inhumanity of Occupation. International law guarantees the right of occupied people to resist Occupation. In practicing my right, I have called for and organized peaceful popular demonstrations against the Occupation, settler attacks and the theft of more than half of the land of my village, Nabi Saleh, where the graves of my ancestors have lain since time immemorial. I organized these peaceful demonstrations in order to defend our land and our people. I do not know if my actions violate your Occupation laws. As far as I am concerned, these laws do not apply to me and are devoid of meaning. Having been enacted by Occupation authorities, I reject them and cannot recognize their validity. Despite claiming to be the only democracy in the Middle East you are trying me under military laws which lack any legitimacy; laws that are enacted by authorities that I have not elected and do not represent me. I am accused of organizing peaceful civil demonstrations that have no military aspects and are legal under international law. We have the right to express our rejection of Occupation in all of its forms; to defend our freedom and dignity as a people and to seek justice and peace in our land in order to protect our children and secure their future. The civil nature of our actions is the light that will overcome the darkness of the Occupation, bringing a dawn of freedom that will warm the cold wrists in chains, sweep despair from the soul and end decades of oppression. These actions are what will expose the true face of the Occupation, where soldiers point their guns at a woman walking to her fields or at checkpoints; at a child who wants to drink from the sweet water of his ancestors’ fabled spring; against an old man who wants to sit in the shade of an olive tree, once mother to him, now burnt by settlers. We have exhausted all possible actions to stop attacks by settlers, who refuse to adhere to your courts’ decisions, which time and again have confirmed that we are the owners of the land, ordering the removal of the fence erected by them. Each time we tried to approach our land, implementing these decisions, we were attacked by settlers, who prevented us from reaching it as if it were their own. Our demonstrations are in protest of injustice. We work hand in hand with Israeli and international activists who believe, like us, that had it not been for the Occupation, we could all live in peace on this land. I do not know which laws are upheld by generals who are inhibited by fear and insecurity, nor do I know their thoughts on the civil resistance of women, children and old men who carry hope and olive branches. But I know what justice and reason are. Land theft and tree-burning is unjust. Violent repression of our demonstrations and protests and your detention camps are not evidence of the illegality of our actions. It is unfair to be tryed under a law forced upon us. I know that I have rights and my actions are just. The military prosecutor accuses me of inciting the protesters to throw stones at the soldiers. This is not true. What incites protesters to throw stones is the sound of bullets, the Occupation’s bulldozers as they destroy the land, the smell of teargas and the smoke coming from burnt houses. I did not incite anyone to throw stones, but I am not responsible for the security of your soldiers who invade my village and attack my people with all the weapons of death and the equipment of terror. These demonstrations that I organize have had a positive influence over my beliefs; they allowed me to see people from the other side who believe in peace and share my struggle for freedom. Those freedom fighters have rid their conscious from the Occupation and put their hands in ours in peaceful demonstrations against our common enemy, the Occupation. They have become friends, sisters and brothers. We fight together for a better future for our children and theirs. If released by the judge will I be convinced thereby that justice still prevails in your courts? Regardless of how just or unjust this ruling will be, and despite all your racist and inhumane practices and Occupation, we will continue to believe in peace, justice and human values. We will still raise our children to love; love the land and the people without discrimination of race, religion or ethnicity; embodying thus the message of the Messenger of Peace, Jesus Christ, who urged us to “love our enemy.” With love and justice, we make peace and build the future. As a veteran activist, Tamimi has been arrested by the Israeli army 11 times to date and has spent roughly three years in Israeli jails, though he was never convicted of any offence. He spent roughly three years in administrative detention, with no charges brought against him. Furthermore, his attorney and he were denied access to “secret evidence” brought against him. In 1993, Tamimi was falsely arrested on suspicion of having murdered an Israeli settler in Beit El – an allegation of which he was cleared entirely. During his weeks-long interrogation, he was severely tortured by the Israeli Shin Bet in order to draw a coerced confession from him. During his interrogation, and as a result of the torture he underwent, Tamimi collapsed and had to be evacuated to a hospital, where he laid unconscious for seven days. As one of the organizers of the Nabi Saleh protests and coordinator of the village’s popular committee, Tamimi has been the target of harsh treatment by the Israeli army. Since demonstrations began in the village, his house has been raided and ransacked numerous times, his wife was twice arrested and two of his sons were injured; Wa’ed, 14, was hospitalized for five days when a rubber-coated bullet penetrated his leg and Mohammed, 8, was injured by a tear-gas projectile that was shot directly at him and hit him in the shoulder. Shortly after demonstrations in the village began, the Israeli Civil Administration served ten demolition orders to structures located in Area C, Tamimi’s house was one of them, despite the fact that it was built in 1965. The main evidence in Tamimi’s case is the testimony of 14 year-old Islam Dar Ayyoub, also from Nabi Saleh, who was taken from his bed at gunpoint on the night of January 23rd. 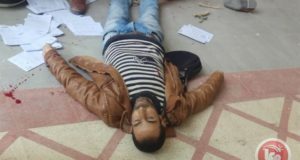 In his interrogation the morning after his arrest, Islam alleged that Bassem and Naji Tamimi organized groups of youth into “brigades”, charged with different responsibilities during the demonstrations: some were allegedly in charge of stone-throwing, others of blocking roads, etc. Despite being a minor, he was questioned in the morning following his arrest, having been denied sleep. He was denied legal counsel, although his lawyer appeared at the police station requesting to see him. Only one of four interrogators present was a qualified youth interrogator. While the trial-within-a-trial procedure has not yet reached conclusion, the evidence already revealed has brought a Military Court of Appeals to revise its remand decision and order Islam’s release to house arrest. Ever since the beginning of the village’s struggle against settler takeover of their lands in December of 2009, the army has conducted 71 protest related arrests. As the entire village numbers just over 500 residents, the number constitutes approximately 10% of its population. 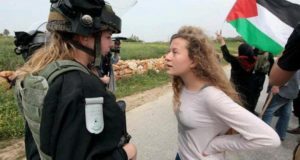 Tamimi’s arrest corresponds to the systematic arrest of civil protest leaders all around the West Bank, as in the case of the villages Bil’in and Ni’ilin. Only recently the Military Court of Appeals has aggravated the sentence of Abdallah Abu Rahmah from the village of Bilin, sending him to 16 months imprisonment on charges of incitement and organizing illegal demonstrations. Abu Rahmah was released on March 2011.